For a program that has only been operating for two years, Enactus Ireland has sure made an impression. 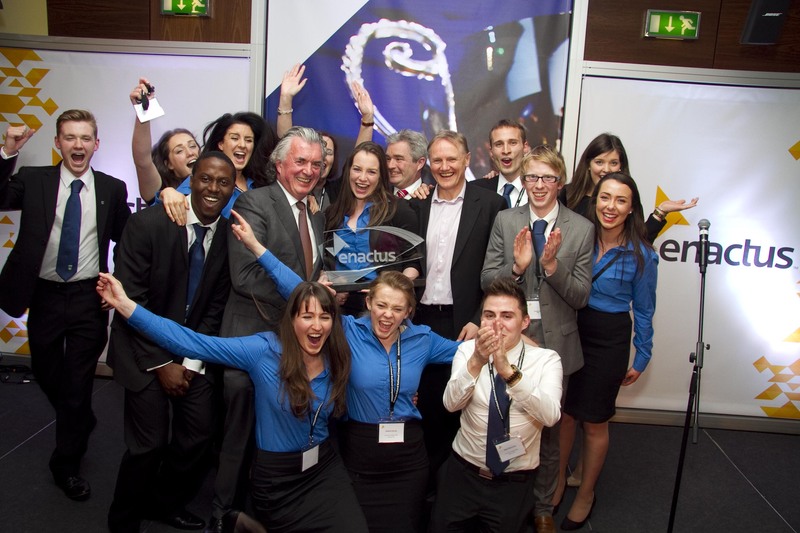 Nearly 225 people met at Chartered Accountants House in Dublin on 27 May for the Enactus Ireland National Competition, which saw eight teams compete for the national champion title. After two rounds of competition, judges awarded the title to the team from University College Dublin, impressed with their social entrepreneurship initiatives, including Generation Accommodation. In true Enactus style, the team saw an opportunity to address two community issues with one project: the challenge faced by students to find safe, affordable housing, and an increasing elderly population living alone. Using a simple but effective business model, the project matches elderly homeowners and students, and provides a social and legal framework to set up a rental agreement. Participating students are able to find housing on average 40% less expensive than the overall rental market, and the homeowners add an income stream that doesn’t affect their pension, all while gaining companionship and the opportunity to learn from and experience a different generation. Based on the level of involvement, it is clear that the Irish business community believes in the power of the Enactus program and the potential the students have to make a difference. The competition was generously sponsored by an impressive list of leading organizations including KPMG, AIG, Arthur Cox, Enterprise Rent-A-Car, IFG, Musgrave Group, The Ireland Funds, Unilever, Gibney Communications, Chartered Accountants of Ireland, Event Partners, The Irish Times, and RR Donnelley. There was also significant individual involvement from leading business people including Brian O’Gorman, Managing Director for Arthur Cox who gave the Opening Ceremony welcome; and Terence O’Rourke, Chairperson of Enactus Ireland who gave the welcome at the Final Round. With a shared competitive spirit, Joe Schmidt, Head Coach of the Irish Rugby Team spoke about leadership and the transformative power of youth during the closing ceremony. Students also had the chance to hear further from leading executives at a Leadership Panel session, where four executive shared their views on the topic ‘Is leadership born or built?’ and answered questions from the students. The panel included Edel Clancy, Director of Communications for Musgave Group; George O’Connor, Managing Director for Enterprise Rent-A-Car; Sean Hehir, Executive Officer, EMEA for AIG; and Catriona Fottrell, VP/Director for The Ireland Funds. As one of Enactus’ greatest global supporters, KPMG has also stepped up to support Enactus Ireland; as evidence of their belief in the potential of this young program, they funded a bursary program to send two students from each of the competing teams to Enactus World Cup this October. In all, 14 travel bursaries, each worth €500, were awarded during the competition. The future is clearly bright for the Enactus Ireland program, and we congratulate them on a successful competition and the impressive impact they are having in communities across the country.